Nova Nukers! is a multiplayer battle game for up to 4 players (online and local)! Explode your friends on colourful planets with a large variety of bombastic items! Jump into online multiplayer to play with players from around the world, invite friends from your friend list for a private online session or get together with them at your place to enjoy the action on your home couch. Alternatively you can also test your skills first and battle the AI-Bots at 5 increasing difficulty levels. The game is developed by Lemonbomb Entertainment. Nova Nukers was at Gamescom for the third year in a row and we of course had the chance to yet again interview one of the developers to see how far the studio has come with the development of the game. We talked to Linda Trefler who is the concept artist for Nova Nukers. She also does a lot of other things for the company, such as level design, website design and other art-related things. “We have now pushed the game to a new level,” said Linda, continuing to tell us about the new in-game UI, the fact that the game feels a lot smoother than ever before and also because the characters all have their own unique feel and style right now. “You can probably notice the changes, only if you knew the past builds of Nova Nukers.” The studio actually wants to release the game on Steam, PlayStation 4 and Xbox One, all at the same time, so for that reason the release is delayed just a little bit more. 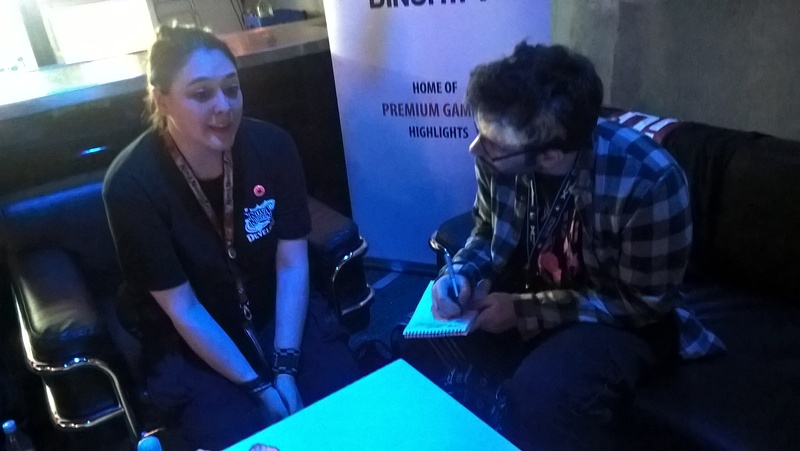 “Gamescom has always been a great experience for us, especially because of the Indie Arena Booth, which is bigger and better than ever before,” said Linda. The team also brought a lot more merchandise with them this time to give out to the players that would come and try out the game. You can find out more about the game through its Steam page and Facebook page.